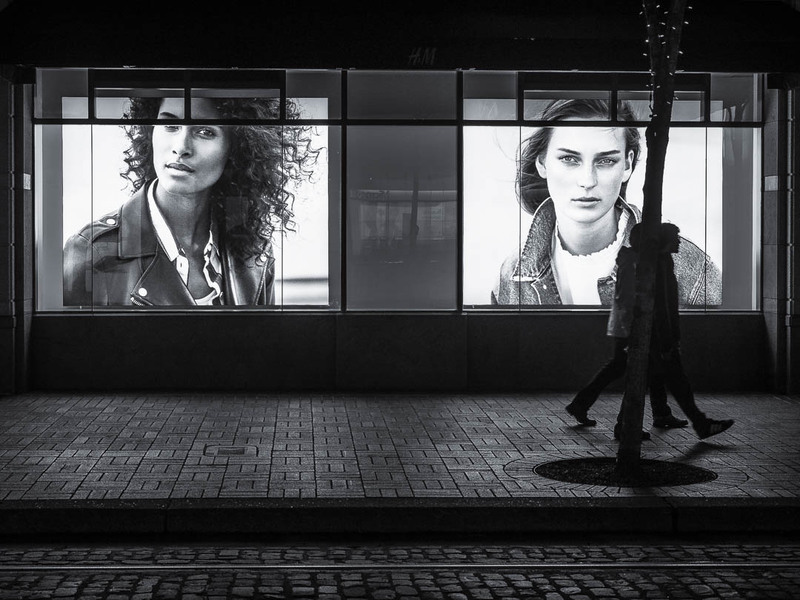 While roaming through Portland the other night a brightly lit storefront of a H&M shop caught my eye, with headshots of models looking out on the dark streets. From experience I was sure that this could make a good backdrop for some street photography, so I placed myself on the opposite sidewalk and waited for people to pass in front of the lit windows. The thing was, it was way past 9pm (happens when you work all day and evening on a business trip) and the Yamhill Street near Pioneer Square was pretty much deserted. Finally a couple walked by and I squeezed of a first shot with 1/10 sec to get blurred silhouettes. And here is where the tip comes in. Don’t just walk away once you get your first shot. Look if you can vary it or if you can take a photo from a different angle or different shooting specs. Portland MAX (Metropolitan Area Express) Light Rail Trains are passing through Yamhill Street. 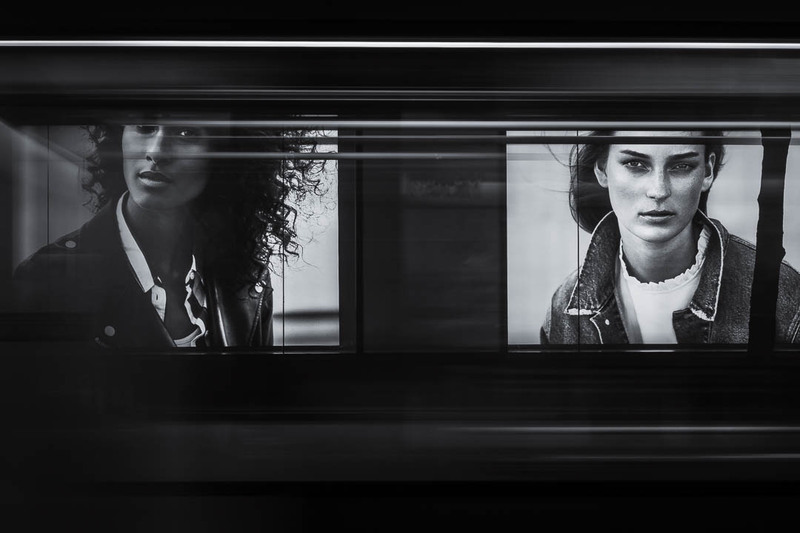 So I thought I try to shoot the models through the windows of a passing train. Using a low shutter speed of just 1/5 sec I knew the models faces would be visible behind the motion blurred train car that would be just visible as phantom streaks (the title image is another version of this variant). But I was still not done. On the opposite side of Yamhill street was a big Microsoft store. 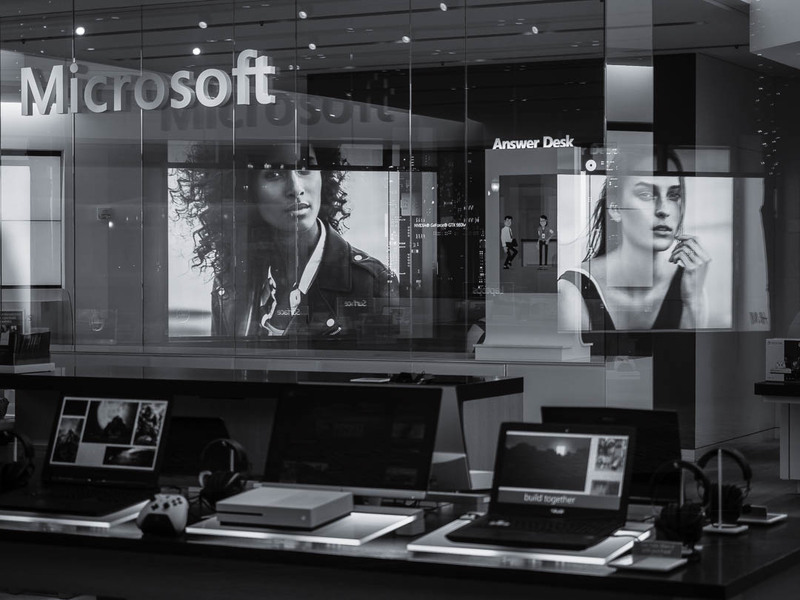 And the H&M model posters reflected beautifully over the MS laptops. So this was another variant of the original scene. My last shot of the scene was similar to the first one. 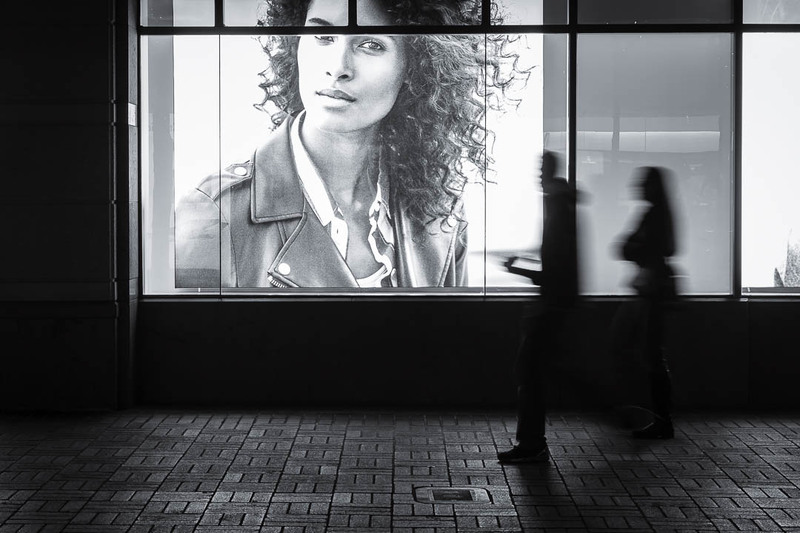 Pedestrians in front of the store windows. Only I wanted to have them sharp (hence 1/80 sec shutter speed) and I photographed them leaving the frame, as the intended story is their ignorance towards the advertisement. So you see, plenty options for one setting. 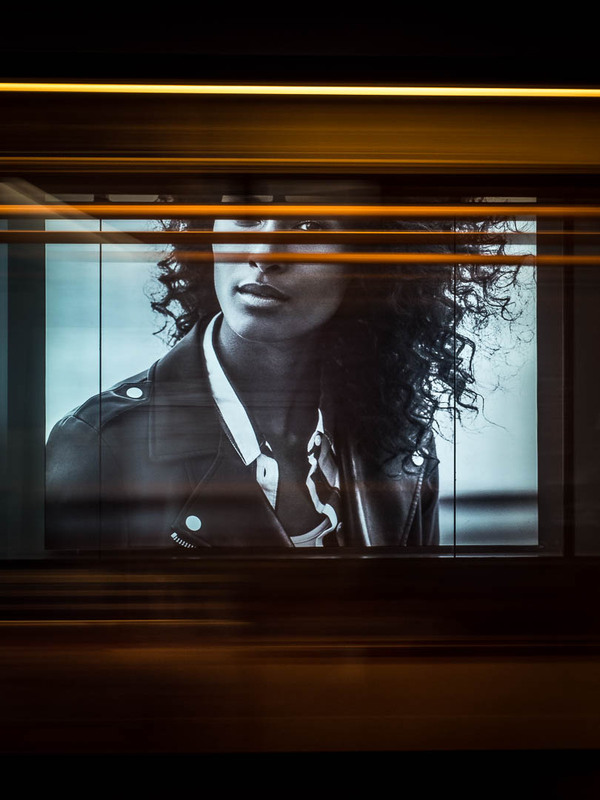 Make sure you really “work” the scene next time you are out in the streets and find an interesting backdrop. All photos taken with the Olympus PEN-F and the mZuiko 12-40mm F/2.8 Pro Zoom. Wow, I discovered your Posts far too late. I have no talent for fotography at all, but for my Page I am now forced to learn it. And I am also enjoying it. Your pictures are amazing. I am anxious to learn more. Thanks a lot! Thank you for the tips! Super helpful. Thanks for the tip! I especially liked the train version. Never would have guessed that’s what it was or thought to try that. Great work. Representation of black and white pictures is so beautiful. As an Photographer i can understand your efforts and even i started writing tips to help new photographers to make career in photography, you can see my work at https://www.behance.net/NitinKhannaOR and also let me know if there is something to add-on. Thank you for your words and wishes. Ach was soll ich sagen, ich finds mal wieder richtig grandios! GErade die erste Szene mit den vorbeigehenden Fussgängern… Soooo gut. Ein Motiv, das ich auf jeden Fall auch auf dem Schrim gehabt hätte (glaube/hoffe ich) wenn ich dort die Kamera zur Hand haben würde. Klasse! Thank you….excellent advice and superbly illustrated with your photographs. I rarely shoot at night so this story inspires me to start. Thank you Marcus and I agree with your advice. Patience can be a virtue of street photograph. Thanks for your great words, Tim! Excellent suggestions. Fun to see my neighborhood through your eyes! Wonderful photos and excellent tip. Thank you so much 🙂 , love your feedback! if you are interested in learning professtion photography, photo editing, and about trick photography, speciall effects.